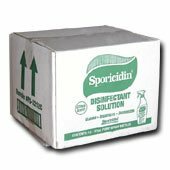 Case of twelve 32oz Pump Spray Bottles Sporicidin Disinfectant Solution. EPA Registered. Bactericidal, Virucidal, Fungicidal - kills mold and mildew and inhibits re-growth for up to 6 months. An effective Cleaner, Disinfectant and Deodorizer for residential, food processing and institutional applications.